Autumn/Winter 2016's top-line fashion trends may be wildly different from each other, but they're all supercharged with one major element—creative electricity. That may sound obvious. Of course designers switch things up each and every season to offer new and exciting things, you're thinking, but there's something about the industry right now that's pushing boundaries and offering up new sartorial ground to be stomped upon. The fashion world is in a major state of flux: The concept of see now, buy now is increasingly important (well, you don't want to wait, do you? ), and many designers and super-brands are also rethinking not only how they present their collections but when and to whom. The old-school fashion calendar or idea of the runway show is being pinched and tweaked into new forms, and this overdue disruption has sparked an inventive energy—one that results in seriously covetable clothes, whether outré and bold or honed to perfection for everyday wear, without scrimping on luxe detailing or points of difference. Some of the most talked about labels of A/W 16 didn't even have fashion shows. Some buyers are investing heavily in menswear brands for women. Some hyped-up names create limited-edition runs only and are challenging the norm with super-high price points or controversial trends (gigantic shoulder pads, anyone?). But all fashion editors are in agreement that now is the time to be you—take A/W 16's trends and make them your own. Mix and match if you want to. Wear them head to toe if you want to. If you've always harboured a love for dramatic costuming, now is your time. Or major purists out there who only wear white and black? That's entirely cool too. Don't be afraid to step out of the norm—individualism is seriously on trend. But enough of the business speak; let's get down to what's important for your A/W 16 shopping list. Scroll to see the top fashion trends for next season so you can brag well in advance and get your must-wear plans in order. Who doesn't love stripes? 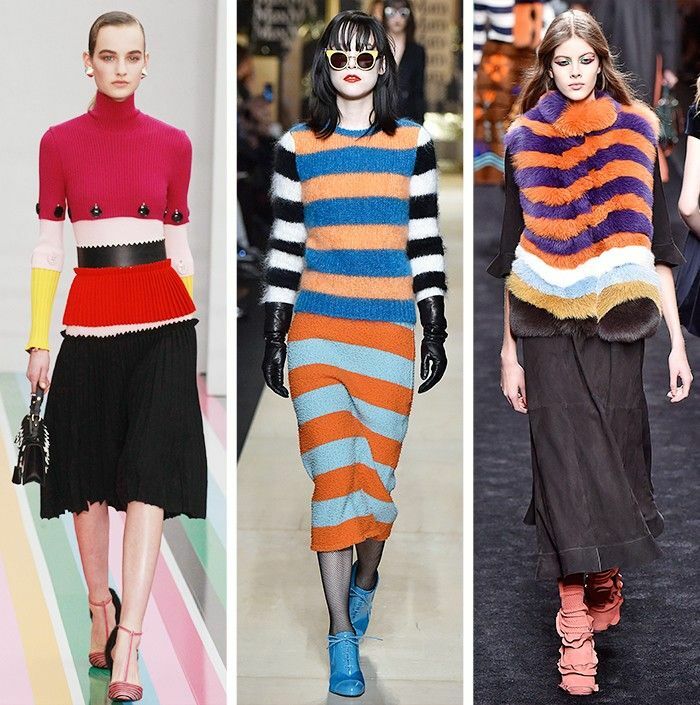 But even better than your average Breton, designers have run with the linear look, combining unusual colours, different proportions and textures for a new take this season. Join the bold barcode brigade, we say. Find out how to wear stripes now with our handy street style auto-cues. Horizontal stripes are all well and good, but there's plenty of asymmetry, patchwork and contrasting layers going on too. We love Joseph's idea of a knitted striped scarf worn with a sweater and a cardigan—the new print clash, surely. You wouldn't exactly call this movement minimalism, but if you can imagine a time when designers are really focused on creating the kind of luxe everyday clothes that do the job simple pieces do—with the added bonus of really interesting pattern cutting, fabrications or details—you're on the right track. Not only are subtle statement separates key, so are accessories. We predict this neutral, colour-blocked, knotted-handle shopper from Céline will be a top choice for girls on the go. Grab and run! Shop from our edit of the luxe everyday clothes you'll love forever. Conceptual tailoring is key to this elevated everyday-wear trend for A/W 16. The more you can tie, wrap, loop, fasten and scrunch your tops, trousers, coats, jackets and trousers, the better. Cats are officially one of the most Instagrammable things ever, so is it any wonder designers have delved into the world of felines? From literal pussycat prints through to kitty jewellery and reworked classic leopard prints, there's no shortage of ideas to sink your claws into. You can see the cat trend in action on the street style stars of fashion week here. Shop from our favourite leopard-print shoes. The 1980s was writ large across the runways of London, Milan and Paris. Power dressing is back, but the lens is predominantly focussed on eveningwear: Spiked stilettos are back in town, as are satin, ruching, oodles of gold jewellery, fishnet tights and asymmetric cuts. Leather and lace, latex and lurex—no after-dark outfit detail is left unadorned or devoid of shimmer. Hedi Slimane's final show at Saint Laurent is the benchmark for '80s cocktail attire. His show was a standout of the Paris Fashion Week schedule, with many commenting it was his best to date. The exaggerated sleeves and arms, set against the teeny-tiny body-hugging silhouettes and gigantic waist-belts, played homage to the most decorative decade of the 20th century, but a more mix-and-match approach felt right for the Instagram generation of today—and of course, the rocker-chic aesthetic he owns brought further edge via punk-infused makeup. If that all sounds a bit OTT for you, there were more casual day-to-day takes on '80s fashion, too. Upgrade your blazer collection with something sharp-shouldered, and wear it with that crop top you've had for years, à la Topshop Unique. Or, invest in a pair of Isabel Marant's pointed flat ankle boots—they're set to be the French designer's latest smash hit in the accessory department (as well as those totally retro loop belts). See how to do the 1980s trend with our handy step-by-step guide. Arriving in a shocking array of bright hues, velvet is no longer the fabric of dark, romantic, gothic evening-only clothes, but one to be mixed into the most vibrant street styler's daytime wardrobes. You'll find it used in everything from trouser suits to thigh-high boots. Of course, despite velvet's make-under into daywear, there was plenty of it that felt just perfect for a soirée—from Haider Ackermann's pink velvet skinny pants to Erdem's stunning embroidered velvet cocktail dress. NB: Velvet is particularly good when worn with metallic accessories. Sure, we all know sport luxe—it's been around for yonks—but this next level of adventure-seeking, high-throttle, all-terrain athleticism is quite different. A/W 16's girl is kind of the badass chick who rides in on a motorcycle, paraglides to work, is an expert off-piste skiing champ and probably wears her bulging outdoorsy wardrobe with her regular attire. Hiking boots are back with a boom, and nowhere more so than at Louis Vuitton. These futuristic lace-up ankle boots are on many a fashion editor's hit list and can be worn with everything from matching leather pants to flirtatious miniskirts. Prepare to stomp into A/W 16. Sporty outerwear is the key pillar of this mega-trend, as exemplified by the reinvented, repurposed puffa. Balenciaga's shrugged-off-the-shoulder versions are king—but you'll need to know that this isn't a practical concept. Wear yours with shimmering eveningwear and utter nonchalance. Corsetry has returned from fashion Siberia in a very noticeable way. The most approachable is the idea of wearing a bustier over a dress, but the underwear-as-outerwear styling can be taken to more literal extremes, should you wish. The corset trend is already gaining momentum—shop the best corsets, and see them in celebrity action. Corsets quite literally cinch a look together—Miuccia Prada used hers over multiple layers, including coats, while Victoria Beckham has heralded them as a new kind of pull-on everyday top to be worn casually with flat shoes and midi skirts. The runway's penchant for Little Edie–style eclecticism continues, and this time everything's been ramped up yet another eccentric notch. Imagine raiding a grand dowager's closet and throwing on whatever you find with wild abandon: All of nana's favourites are in here, but they're powered up in terms of exotic prints, colours and styling combinations. It's all about having the confidence to pair the unexpected—headscarves are key, furnishing fabrics can be worn in clothes, and geek-chic glasses and socks-with-sandals are both completely normal outfit updates. Darkness descended onto many a catwalk for A/W 16, but this was no gentle foray into lightweight goth garb—designers opted for full-on dramatic, theatrical ensembles that matched steampunk Victoriana with modern twists like denim jackets or tweed skirt suits. Burberry's angry boots are going to be a key pickup for the street style set—and don't be surprised if you see them worn with laddered or patterned tights either. Softcore options on the goth trend are on offer: You can simply use this as one big excuse to wear your favourite black head-to-toe ensembles without judgement, or dip in with metallic hardware-embellished pieces—something you'll no doubt be used to with this season's eyelets dotted around the place. Want more? Check out our guide to the biggest autumn/winter 2017 fashion trends.